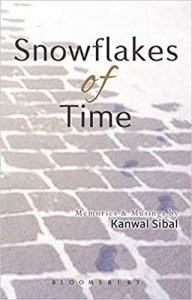 Snowflakes of Time is a collection of about a hundred poems divided into eight sections, presumably to separate them by themes. The author is a former Foreign Secretary of India. The compartments are not watertight. The sadness of ‘Time passed’ and ‘What might have been’ runs through a good number of poems in different sections. Also what the writer calls his communion with nature. Pulling it over its limbs . . .
As he rolls through flurries of time. Only thoughts can travel, . . .
Of the present . . .
Year after year . . .
Its face lost its glow . . . Felt it was a wanted part . . . The author’s style of writing is simple—deliberately so. Poetry, he believes, should not be so abstruse that it’s meaning is not immediately clear. There is a danger here, of course, of the reader racing through the poem, not pausing to admire the scenery, impatient to know the end. For many of the poems are also narratives. Perhaps the trick is to read the poems twice, savouring every word the second time. All that it meant before . . .
Then there are the three poems shaped, yes, unbelievably shaped, like their subjects: ‘Letters Perfumed’, shaped like a perfume bottle; ‘To Your Health’, shaped like a champagne glass; and ‘The Heart of Memory’, shaped like a spade in a deck of cards. These must have been hard to get right. They are an absolute delight to read, as are also the few poems written for the amusement of his children. The sense of what is in our mind . . .
Pakistan gets the lion’s share of these poems. But others are not spared. The West gets its fair share in ‘Double Standards’ and a couple of other poems; Rajiv and Rahul Gandhi perhaps more than their fair shares; politicians as a tribe perhaps less. But the hardest blow is left for those whom the writer calls, sarcastically, the ‘True Nationalist’, whose aim is described in the last words of the poem. The biting words in this poem—or, for that matter, in any of the poems in this section—may make some readers squirm, but it is hard to argue with them. And one is left absolutely speechless after reading the solution, with sarcasm dripping from every line, that the writer proposes for Dalits in his ‘Unearthly Politics’. To distant planets they must race . . .
Kiran Doshi is a retired diplomat and author.